We guarantee that our products will work well in their life circle and we will be responsible for any products we sold. We are proud to say that up to now we have never received serious quality claim from our customers. So please join and be our new customer. Our factories have strong technical support and modern inspection system, all products (DSB: diamond saw blade) are tested strictly and will pass the quality certificate by Germany MPA(DSA). It ensures safe operation & effective usage. 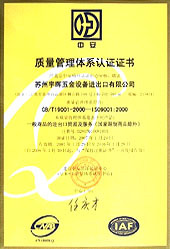 ISO9001 certificate for Abrasive materials, Bonded Abrasives, Coated Abrasives, Super abrasives. Fiberglass self-adhesive mesh tape, Fiberglass alkali-resistant mesh, Drywall & plaster Sanding Screen/Abrasive Screen, have successfully entered into international markets and are sold well in more than 40 countries and regions with excellent reputation for the good quality. CAD(Computer-Aided Design): Exclusive computer aided design ensures precision in the design of each part. 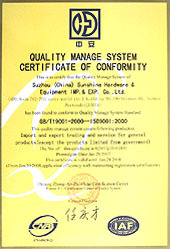 Advanced methods of producing and testing guarantee the uniform high quality. United and effective staff will provide you perfect service. 90% of Materials used can be recycled for protecting nature. We send our group to workshops to supervise and inspect. We audit our factories by our own experienced engineers, using our own documents; our engineers stay in factories to solve technical problems if happened; and before each order delivered, our own inspector will do sample testing again to make confirmation.